I went into the third chapter of The Odd Gentlemen’s King’s Quest reboot with my expectations slightly lower than normal after a less-than-stellar second episode, but by the halfway point I felt that they had fully turned things around. There’s a shaky start to Once Upon A Climb with a couple of puzzles that feel a bit superfluous, but then the core narrative reasserts itself and it moves along at a much brisker pace. The focus this time is on King Graham’s quest for love. He’s won his kingdom, his subjects are happy, he’s spent an awful lot of time in the gym – but he’s terribly lonely. Subtle digs from his guards even prompt him to make a fake dinner guest using a coat stand, a poster, and a hat made from a napkin. Dire straits indeed. At the behest of his trusty magic mirror, he sets off into the wilds where he’s heard that there just happens to be a pair of rather lovely princesses in need of rescuing from a tower. 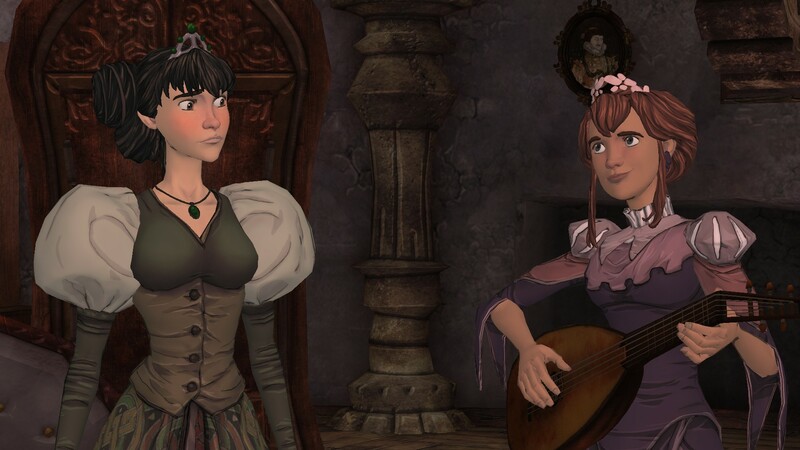 Riffing off Rapunzel (the Tangled version in particular), Once Upon A Climb also takes a good deal of inspiration from comedy classic The Princess Bride. The talky humour feels reminiscent of Carey Elwes’ swashbuckling adventure, particularly thanks to the theme of true love – and Wallace Shawn returns as Chapter 1’s Manny, too. But the greatest success of Chapter 3 is the introduction of the aforementioned princesses, Vee and Neese. Far more than just sounding boards for Graham’s clumsy ramblings, both women have unique personalities, likes and dislikes that you’ll need to figure out and appease as you attempt to decide which is your true love – a choice that never really feels is Graham’s to make. While dealing with various perils – not least the wicked witch Hagatha, who keeps the princesses locked in the tower – you’ll genuinely feel you’re getting to know them, and you’ll want to avoid making mistakes that reduce their favour. Not as busy or involving as the first chapter, Once Upon a Climb makes up for a its slower pace with its colourful characters and sense of adventure. There’s real chemistry between Graham, Vee and Neese that slowly moves into love triangle territory as he begins to win over their affections, making for some great moments. As always, it’s worth at least two playthroughs to investigate the results of different narrative choices, but my natural first playthrough felt satisfying on its own. Though, I did spot a returning character who I’m sure died in my run of Chapter 2, which was a bit jarring. 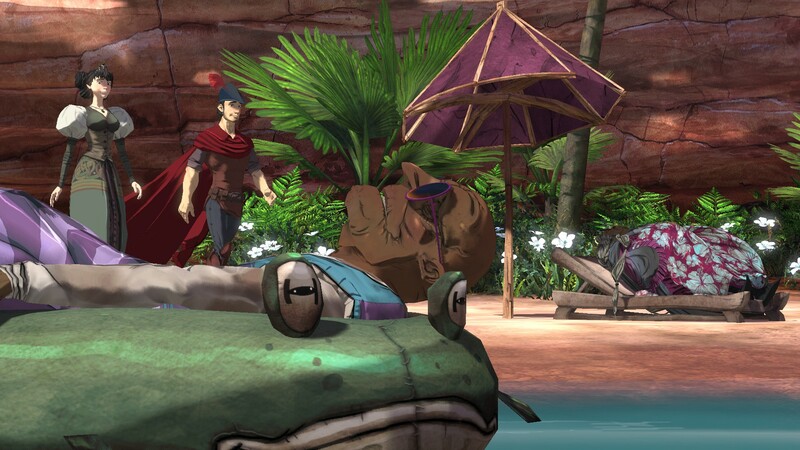 The Odd Gentlemen should be wary of moments like that if they’re going to sell King’s Quest as a choice-driven adventure. 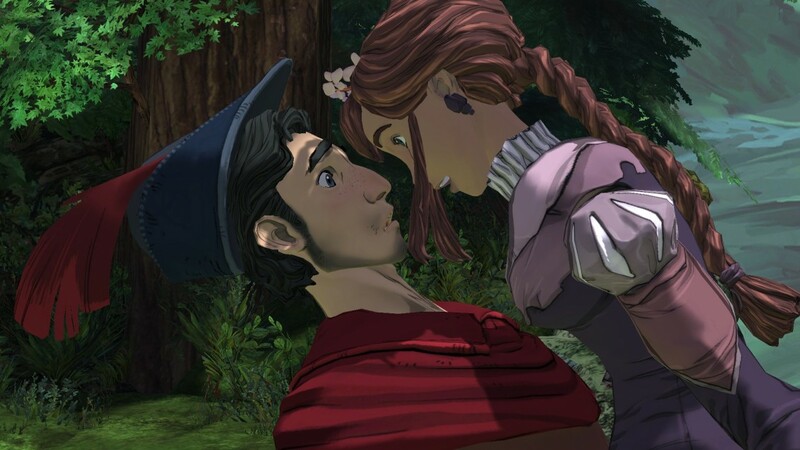 Graphically beautiful and well-acted, Once Upon a Climb is a solid return to form for the King’s Quest reboot, but a faster release schedule would be much appreciated. Four months or more between episodes is a long time to wait and it’s not always easy to remember every choice or story beat from previous instalments, which robs some of the impact. I could barely remember the present day stuff with King Graham’s grandchildren, for example, and so felt way less invested in the burgeoning drama between the siblings than in Graham’s retelling of his adventures. Some of the puzzles felt incredibly tricky simply because you so often have to resort to clicking and combining everything, which is more tedious than genuinely challenging, and more than once I had overlooked a simple solution because I hadn’t found every part of the puzzle. Often failures result in going back a few minutes, which isn’t a problem in itself, but becomes irritating when you have to watch the same conversation or cutscene play out several times. So, Once Upon a Climb is a strong third entry then, and repairs relations between player and game after the slightly dull previous instalment. Some of the puzzles are a little hit and miss and it takes a while to get going, but the central narrative, new and returning characters, and romantic humour make for a likeable, charming episode. Once Upon a Climb is a strong middle episode that makes us much more hopeful for the next.